I’m not a big fan of conferences because the presenters usually, if not always, promote themselves and/or their business under the guise that you may learn something new and impactful. Recently, however, that changed from a conference I recently attended that really made me think “differently”. It inspired me, it motivated me and most of all it educated me. ​The first statement I heard and immediately related to was “What keeps me up at night”? That is a loaded question from both a personal and professional perspective. For this RANT, I’ll keep it professional. What keeps me up at night is watching and witnessing the retail destruction. The demise of brick and mortar retail scares me from a multitude of perspectives, primarily as it pertains to present and future employment at retail and manufacturing. 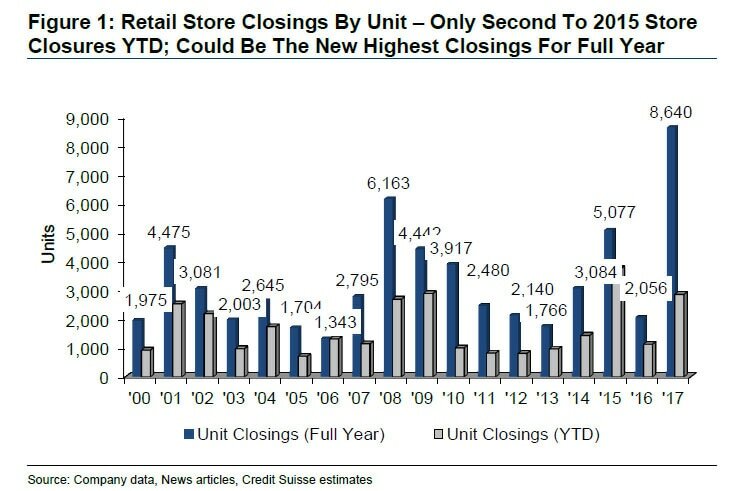 It is predicted that 8,600 retail storefronts will close this year. How many in our category? A bunch I bet! ​In my opinion, this is an indicator that all retailers MUST be aware of and change now. If the Big Guys are feeling the heat, with all their money and access to technology, what's a smaller retailer to do? The fact remains, consumers want to shop/buy locally, but retailers seem to stay focused on "price" to drive sales instead of technology to increase efficiency, create content, conversations,and connections. ​Then I look around and see signs everywhere with stores closing and Plants closing and everyone immediately blames the internet for the retail debacle, or Asian manufacturing for the manufacturing debacle, or whatever..., which leads me to my next nightmare that keeps me up at night. We don’t make stuff anymore and that’s because we don’t teach STEM – Science-Technology-Engineering-Math. I have a great mentor and he always talks about Sputnik - was the first artificial Earth satellite. The Soviet Union launched it into an elliptical low Earth orbit on 4 October 1957. This shocked our nation into innovation and caused the space race. The launch ushered in new political, military, technological, and scientific development surge – the second American industrial revolution. Our education system is more focused on degrees in “nothingness”, with some institutions actually giving degrees in social justice which may be noble to some, but I’m confused how that degree helps us compete in STEM, which is the foundation for forward thinking, problem solving and innovation, ultimately with the goal of INNOVATION and “making stuff”. ​In a recent Wall Street Journal Article on June 5, 201 by Douglas Belkin wrote; “Freshmen and seniors at about 200 colleges across the U.S. take a little-known test every year to measure how much better they get at learning to think. The results are discouraging. I have many more nightmares I’m awake through relating to education, or the lack thereof, but because of content/word restrictions, I’ll keep it short for this RANT and expand on each subject in upcoming RANTS. ​The next statement is so simple, yet so profound! ​– or it’s too hard – it’s too expensive – it’s WHATEVER. It’s an excuse and easy way to QUIT. That’s it and that’s all you need to know! Life is hard and business is even harder because you have other lives that are dependent on you whether they are customers or employees, or both. If you are a Star Wars Fan, Even Yoda “got it”. ​In the home furnishings industry, we have lost over 450 manufacturing plants, over 230,000 jobs, many of these job losses are related to furniture factories and related and supporting businesses, yet the scariest part is, according to Home Furnishings Business magazine is, we’ve lost close to half of the 60,000+ home furnishings and furniture stores during the period 2007 to 2015. ​The US furniture retailing industry, pure-play furniture stores includes about 24,000 establishments (single-location companies and units of multi-location companies) according to Dun and Bradstreet. My estimates are we’ve lost over 10,000 pure-play brick and mortar furniture storefronts during this period. ​When I discuss technology with retailers and brands, I get “the deer in the headlights” look, usually for two reasons; They don’t understand it or they think they can’t afford it … or usually both. Then I look around and see signs everywhere with stores closing and Plants closing and everyone immediately blames the internet for the retail debacle, or Asian manufacturing for the manufacturing debacle, or whatever..., which leads me to my next nightmare that keeps me up at night. Here’s one example. Yes, I know I’ve RANTED about this over and over, but my mentor has drilled it into me; “Water dripping on a stone leaves a mark”! Manufacturers don’t help their retailers with standardized product data. Why is that? Is it really IMPOSSIBLE – too hard – they don’t know how – or does the arrogance of ignorance come in play? Everything today is digital and everyone knows the facts 85% of all home furnishing searches start “On the Web”, AND 85%+ would prefer to shop LOCALLY. To find what the consumer wants, the product, its information, warranties, dimensions, availability and more MUST be available. For that to happen, all this information must be in one location and available to stream, via API or other means to a retailer’s website with the data being updated at least once weekly, preferably daily. I tried to make this happen 3 years ago, offering to standardize their data for FREE and was astounded that 90% of all the manufacturers I approached had NO CLUE how to get the data, much less standardize it. One major brand had their product data in PowerPoint and updated the files and sent them to the reps …. WHAT ???? Here’s another example. Yes, I know I’ve RANTED about this over and over too, but again I say - “Water dripping on a stone leaves a mark”! mANY Retailers refuse to try understanding and engaging the new consumer ON THE WEB. Of all things that drive me crazy is that retailers don't embrace technological solutions to help them show more, tell more and sell more. Of all the industries out there, the home furnishings industry are essentially Neanderthals when it comes to embracing technological solutions for their business. Take Search For Instance. When you go to a home furnishings website and click on an item, wouldn't you want to see all the items populated with that "LOOK"; the same colors, same frame options, etc? NO, instead they embrace that archaic "Shop by Style", whose definitions of style; contemporary, modern, traditional, classic are ambiguous at best and are so teen years ago. How About Business Analytics, visual recognition that show accurate store counts, by hour/day/week for staffing/marketing analytics and HEAT MAPS in your store where people congregate so you can SEE your merchandising successes and/or failures. Guess what, all furniture e-tailers only do special orders and they sell more than you do or ever will! Ask yourself why that is? ​Why not put a price guarantee on your website guaranteeing you won’t be undersold on the “exact same SKU, delivered to the exact same address". Duh, I’d rather sell one of something and make something, than sell nothing and make nothing. To do this and manage it. I’ll bet you’ll be all over managing your liquidation sale to be sure you squeeze out every dollar of profit prior to closing your doors. ​My last statement will encompass more of a definition of what it means and why you MUST embrace it. CREATIVE DESTRUCTION. I read this in a book by Charles Koch – The Good Profit and it was an Ah-Ha moment. It simply defined what I RANT about all the time and reignited my passion with definition. If it’s not broke, break it, because if you don’t do it, someone, or something else sure will. The term was coined by Robert Schumpeter, who taught at Harvard during the 30’s and 40’s. ​Our industry doesn’t embrace this theory as it should. Think about the definition above. Is this happening to your business now because you have resisted change? The new commodity is the internet, the new technologies are everywhere that can help you sell more, the new source of supply is Amazon, Wayfair, e-tail and you’ve refused to change how you show, tell and sell. ​And lastly the new organization. You’ve kept the same people, the same processes and you’re doing the same thing over and over expecting a different result and you stand there confused … why you haven’t experienced any results ....Einstein. The short definition of DISRUPTION is defined as a “disturbance or problems that interrupt an event, activity, or process”. This is what is happening everywhere in the retail sector. CREATIVE DESTRUCTION & DISRUPTION is happening to retail brick and mortar retailers every day, and I bet it scares the heck out of you and your operations. If you aren’t scared, you should be.